Ciara Silke is a silk scarf designer based in the west of Ireland. Having worked for some of the top fashion companies in the US she decided to experiment with natural materials and colours to create her very own scarf line. She studied fashion and textile design in NCAD Dublin. From there she went onto work for the iconic Diane Von Furstenberg label in New York. She spent many seasons there, developing her design skills, pattern skills, and learning about the business side of design and manufacture. 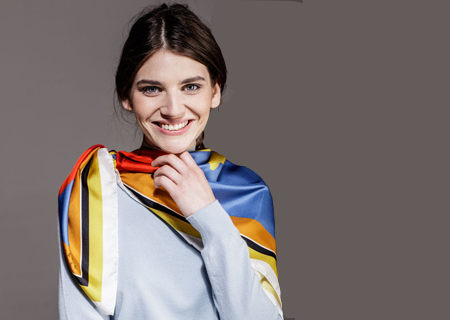 Returning to Galway city from New York Ciara started her business – specializing in a luxury line of silk scarves – a line inspired by the beauty, colours and majesty of the iconic Connemara landscape and the wildness of Galway Bay. Each piece is individually designed in Ireland by Ciara, printed on fine silk and cashmere textiles in Como, Italy and hand finished in Galway. Ciara Silke fuses the wildness and vibrancy of her West of Ireland heritage with a modern, sleek, and timeless style, rendered in striking colours and fine Italian fabrics. Vibrant brilliance is the first thing you notice about this scarf. The second is its luxurious feel and modern design. With contrasting hues of yellow ochre, blood red, cornflower blue and black , this African Iris flower has sword-shaped petals in a loose fan. A prolific flower it carries petals on a wiry arching stem. These magical flowers close their bloom by midday. Designed in Ireland. 100% silk twill. This African Iris scarf was chosen by the Design and Crafts Council of Ireland as a highly commended design. This style is available in multiple colours. Lightweight and luxurious, this silk twill scarf blend plays with graphic shapes and modern polka dot textures. This essential Ciara Silke accessory complements any outfit. This silk scarf can be worn many ways – around your neck, as a top, at the waist or as a headscarf. This style is available in multiple colours.